Sim-Plex Design Studio has created an apartment in Hong Kong for a couple that lives with their parrot, an elderly parent and her pet cat. Located in Yuen Long, Hong Kong, the 42-square-metre Pets Playground apartment belongs to a young couple, Ken and Teri, who own a parrot. The apartment is shared with Teri's mother, who owns a pet cat. 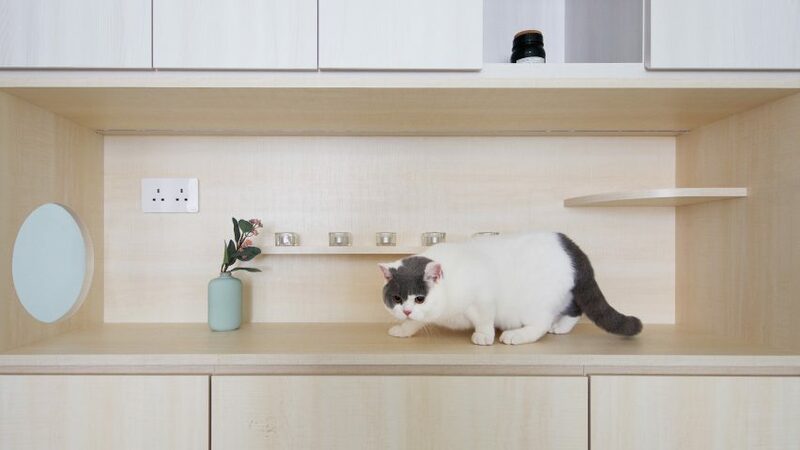 Hong Kong-based Sim-Plex Design Studio designed the apartment so that the couple, mother and pets could all enjoy both private and communal spaces, while preventing direct contact between the parrot and the cat. "We created a flexible layout for the young couple, so that not only the pets could have their own space for activities, but could also fulfill the different living requirements of the two generations of people," said Sim-Plex Design Studio director Patrick Lam. "We hope that the flexibility of the layout of this apartment will enable the homeowners and their mother to have both private and communal living spaces which would stop creating the same problem." Addressing the needs of the pets, Lam explained that the parrot required a large cage, preferably placed somewhere where it could enjoy the sunshine, while the cat needed a litter tray and a space to play and move around. After consultations with the owners, Simplex Design Studio decided to place the parrot cage on a low cabinet in front of the large west-facing window in the living room. Close to the master bedroom where the couple sleep, the cage is positioned in the centre of the window in order to capture the afternoon sun. As the parrot sometimes comes out of its cage, the designers installed three fritted glass sliding doors that close the living room space off so that the parrot can enjoy time outside of its cage without crossing paths with the cat. The living room is located on a raised wooden platform that also helps reduce the chance of the cat from moving quickly towards the parrot's area. The fritted glass doors that section off the living room also serve to create privacy for the apartment's human occupants. When closed, the master bedroom and living room, and Teri's mother's bedroom and dining room become two different zones. "When the couple needs privacy or the parrot comes out, they can close the sliding doors," explained Lam. "During dining or family gathering, the sliding doors could be opened to form a large space." In the dining space the table slides away into a cabinet where it remains hidden most of the time in order to create more space for the cat, which has lived with Teri's mother for many years. Meanwhile, the central part of dining room cabinets has round cat-sized holes and walkways. A cat toilet is located next to the apartment's entrance, where it doubles as a seat for changing shoes before going out. Teri's mother's bedroom wardrobe has an integrated cat house, while on the opposite side of the room, a series of built-in shelves are designed for the cat to use as platforms to jump between in order to reach the top of the cabinets that surround the bed. The raised wooden platform on which the living room is located is used as underfloor storage. Lam explained that the original intention had been to use wooden platforms throughout the space to maximise storage space but after considering the needs of Teri's elderly mother, it was decided that this would be too hazardous. By placing the platform only in the living room, Teri's mother is able to easily move between her room, the dining room, bathroom and the kitchen. "This design takes care of the safety of elderly and also makes it more difficult for the cats to enter the parrot's area," said Lam. Other space saving features include the integration of four movable chairs within the low cabinet in the living room that can be used together when the dining table is pulled out. The kitchen and bathroom doors are all topped with a pitched roof shape to fit in with the apartment's pet-friendly theme. The kitchen door is also fitted with a panel of fritted glass to help create a visual connection and allow daylight to filter though. All of the wooden furniture is made from smooth ecological melamine-faced board to prevent the cat from scratching it, while also reducing the amount of formaldehyde in the space which can be harmful to both humans and pets. Other pet-focused interiors featured on Dezeen include an extension to a former council house in Dublin designed by architecture studio TAKA, where a snapping turtle tank provides a view through to a palm tree garden. Another is the interior of this Taipei apartment, which was opened up by Taiwanese design practice ST Studio to create a flexible space for the owner and his two cats.